In an attempt to stop people from “gaming the system,” Google has recently implemented a series of dramatic overhauls to the way websites are ranked in the company’s search results pages. With each passing change, businesses have to completely rethink the practices they’re using when designing their sites along with SEO in general. One of the major changes that Google has enacted in recent years has placed an increased emphasis on mobile sites – that is, sites designed primarily with smartphones, tablets and other devices in mind. This is important for a number of reasons. Ever wondered if your site is truly mobile-friendly from Google’s perspective? 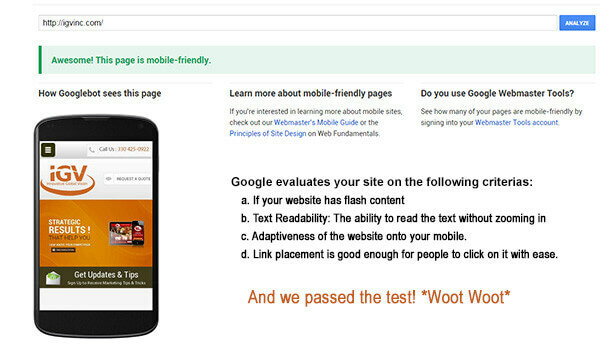 With the launch of Google’s new Mobile-Friendly Testing tool, there is no longer a need to guess. Simply TAKE THE TEST! You will receive a Pass or a Fail certificate from Google. For starters, a dramatically large amount of Internet users aren’t actually visiting sites in the comfort of their own homes throughout the day. In years past, people would commonly wait to get home from the office to do the majority of their website browsing, which was then done from a desktop or laptop computer. Times have changed and users are now visiting the Internet almost exclusively on small, mobile devices with touch screen interfaces. They are doing using links that you send to customers via email, for example, or by links found on social media sites like Twitter or Facebook. One of the main indicators of this advantage is that mobile sites are now being given a “Mobile Friendly” badge in search engine results, letting users know right away which sites are optimized for these devices and which ones are not. The challenge that this represents for businesses has to do with a dramatically different viewing landscape. If you design a site with only the desktop experience in mind, mobile users will be left with a cluttered mess that is impossible to properly navigate on a device like an iPhone or iPad. As a result, responsive mobile-friendly website design becomes hugely important – not just for Google search engine purposes, but for the users themselves. Responsive sites and mobile sites are not the same concept. A mobile site is a layout designed exclusively for a mobile device, while responsive web design allows you to design your page once with all possible viewing environments in mind. With a responsive design, the site will then automatically adjust based on the device that the user is viewing it on. Desktop users can still have their traditional environment while mobile users get a friendly, responsive environment that can be controlled on a small screen with a touch screen interface. If you’d like to find out more information about responsive mobile-friendly website design for your business, please don’t hesitate to contact IGV today at (330) 425-0922. We offer SEO and Mobile-Friendly Development services to help give your site the boost it needs.